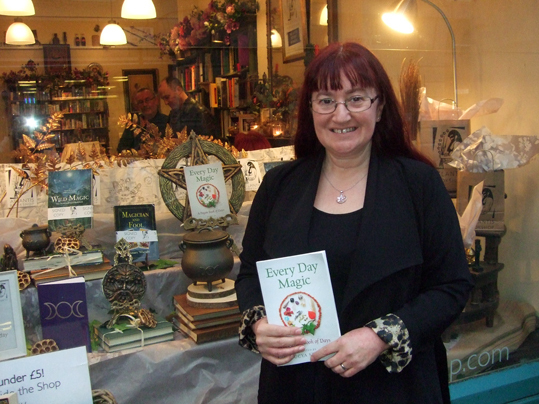 Here's a picture of me outside The Atlantis Bookshop yesterday just before the launch party for Every Day Magic - A Pagan Book of Days. I'll be posting more photos from the party on my blog after I've got confirmation that the people in the pictures are happy for them to be shared. Every Day Magic, which is published by Moon Books, contains contributions from nearly 50 pagan authors and practitioners from many different traditions across the world, including Atlantis' Geraldine Beskin, best-selling pagan authors Ellen Evert Hopman, Melusine Draco, Harmonia Saille, Rachel Patterson, Caroline Wise, Elen Sentier and other Moon Books writers. It contains 366 spells, rituals, meditations, Pagan prayers, divinatory techniques, poems to read and recipes and craft projects to try out, along with the details of festivals that take place throughout the year. In the UK, the book probably won't be sent out to Amazon customers until November 24, which is the official publication date, but you can buy early copies of the book at The Atlantis Bookshop, 49A Museum St, London WC1A 1LY. Some of the copies at the shop are signed by contributors too. For more details email atlantis@theatlantisbookshop.com or call 020 7405 2120.